The prime minister recently said he'd apologize for Canada turning away Jewish refugees fleeing the Holocaust. Conservative MP Marilyn Gladu says that the number of apologies Prime Minister Justin Trudeau has delivered makes them "less special." 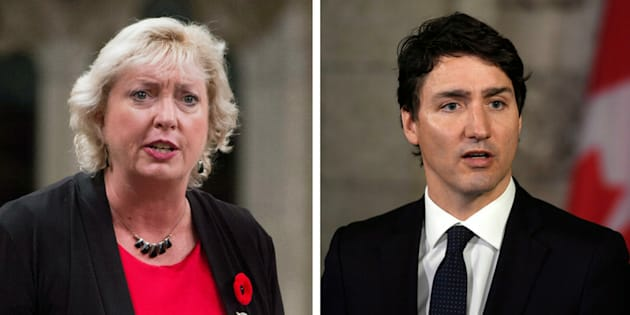 OTTAWA — Conservative MP Marilyn Gladu says that while she supports Prime Minister Justin Trudeau's decision to apologize for Canada turning away Jewish refugees fleeing the Holocaust in 1939, the number of apologies he's delivered makes people question his sincerity. "I think it's worth apologizing for it, but you can have dilution in recognition when you start apologizing, apologizing, apologizing. It makes it less special," said Gladu. Canada seems to be the "apology capital of the world" right now, said Rhoda Howard-Hassmann, a professor emeritus of political science from Wilfrid Laurier University. She said if Trudeau makes too many apologies, people may call it silly, but on the other hand, if he apologizes to one group and not the other, it leaves people behind. In 2010, the then-mayor of Halifax, Peter Kelly, apologized for the destruction of Africville, a north-end community the city bulldozed over 40 years ago. Howard-Hassmann pointed out that while Kelly apologized for the specific incident, people of African descent in Canada overall have not been given an official apology. At a Jewish fundraising event on Tuesday, Trudeau said Canada's decision to force the German ocean liner MS St. Louis to return to Europe was a blight on Canada and while an apology in the Commons will not rewrite this "shameful" chapter, he hoped it would bring "awareness to our failings." The vessel was carrying 907 Jewish passengers from Germany when it was turned away by Cuba, the United States and eventually Canada. About half of the passengers were accepted by the U.K., France, Belgium and the Netherlands. The remainder were returned to Germany, where 254 died in concentration and internment camps. Gladu's criticism stems from the fact that Trudeau has already expressed regret for historical injustices perpetrated by the government against members of the LGBTQ community, for the Komagata Muru incident, which involved a ship load of immigrants from India turned away in 1914 and for abuse and cultural losses at residential schools in Newfoundland and Labrador. Trudeau also apologized for and exonerated six B.C. Tsilhqot'in chiefs who were hanged in 1864 for their involvement in the killing of six white colonists. The Ontario MP said apologies should not be monthly occurrences, adding that it's becoming a "show." "I've heard rhetoric even amongst my constituency that perhaps it's not sincere. What else does he do, besides apologize for things that happened years and years ago?" However, Howard-Hassmann believes that apologies have value when they're done correctly and used Trudeau's apology to the First Nations chiefs as an example. She said they should take place in appropriate venues, be culturally appropriate and include input from those receiving the apology. Conservative MP Deepak Obhrai took a different approach from Gladu. In a statement, Obhrai said he is glad the government has "finally committed to apologize for turning around almost a thousand Jewish refugees." He said he asked for this two years ago. Liberal MP Michael Levitt tweeted that he is disappointed to see Gladu use the apology as a partisan issue. "This apology is long overdue and of great significance to the Jewish community, Holocaust survivors and their families. Hoping such a moment unites, not divides us," he wrote. Nimrod Barkan, Israel's ambassador to Canada, called the matter, "a classic domestic issue in Canada." "We welcome the happiness of the Jewish community with the move of the prime minister," he said. Toronto lawyer Julian Heller said he had family members aboard the St. Louis and while the historical apology is "really nice," he's more interested in what the government will do about people in similar situations today, such as the Rohingya refugees and others from Syria and South and Central American countries.